You know about gloves already, and you probably know whether your hands and fingers are susceptible to the cold. Some people get cold hands quicker than others, and that is partly to do with the amount of muscle in the fingers and hands themselves. If you work in an office or any kind of non-manual type job, you are probably more likely to feel the cold quicker. Avoiding cold hands is essential to keep you feeling positive and able to concentrate, aiding good capacity for decision making and letting you concentrate on putting your feet in the right place, and thus lowering your potential for a stumble, fall and injury, rather than focussing on cold fingers. A pair of lining gloves is often a good starting point when hands start to become cold. 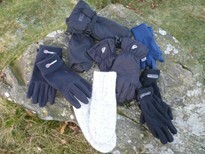 Inexpensive and light, they can keep away an initial chill, with more bulky gloves stored in the rucksack. If a thicker pair of gloves in required, keep on the lining gloves, as they'll keep your hands extra warm and you'll retain some insulation if you need to remove the thick pair of gloves for a short time. Taking a couple of pair of lining gloves also has the benefit of being able to replace one pair should they get wet. Next up from lining gloves are fleece ones, and are a good layer in themselves (lining gloves not required). Fleece gloves come in windproof/non-windproof versions, and also retain some heat when wet (and can be easily wrung out if soaked). Fleece gloves are not bulky, and you should also consider taking a spare pair. When the weather is particularly poor, you'll want a pair of waterproof outer gloves to keep your hands dry. Like waterproof jackets, you can get Gore Tex or other waterproof coating, and prices can get high for a good pair. Try a pair or two of cheaper gloves before you shell out on anything too expensive, and make sure you can fit a pair of lining gloves underneath. Mittens are efficient at keeping your hands warm, as the proximity of your fingers to each other means that they effectively keep each other warm. Gloves don’t have that feature, but do allow more dexterity than mittens. Woollen mittens and gloves keep their warmth when wet, and are relatively cheap too. How many pairs of gloves to take? There's no easy answer to that one, as it depends how cold your hands get, the likelihood of rain etc. Fleece and lining gloves are light and not bulky, so take a couple of pairs of each if the weather forecast is poor, together with a pair of outer gloves. In winter the choice may be a thicker pair of outer gloves, and probably a pair of mitts too. It's better to have a little extra weight and hand warm dry hands than cut right down and be unable to navigate properly because you have cold and wet hands. Another reason for having more than one pair of gloves is so that you have some contingency should you lose one. It happens.